Here is a brand new product from OP/TECH USA. These are a one size fits all product. It will fit any 35mm SLR camera or any D-SLR Digital camera ever made. There is no better way to temporarily protect your expensive camera from the weather. The best part is they are very inexpensive. Don't let the price fool you, they are not cheap, just a good price. Used with a little thought and care will allow for years of faithful service. Each pack ordered contains 2 Rainsleeves. One shipping charge regardless of how many packs you order. The RAINSLEEVE FLASH from OP/TECH USA offers the same great features as the original RAINSLEEVE™ yet can accommodate a camera shoe-mounted flash. It effectively shields a camera, lens and flash unit from the elements and fits easily in the pocket or camera bag. It also features a unique eyepiece opening that adapts to most camera viewfinders, allowing composition of shots through the camera’s lens, not through the plastic. All camera, lens and flash controls are easily seen and operated through the RAINSLEEVE FLASH. The drawstring enclosure will fit any lens up to seven inches (17,8 cm) in diameter and up to 14 inches ( 35,6 cm) long. Conveniently packaged with two per bag, the RAINSLEEVE-FLASH™ is the economical way to make sure camera gear is protected in any kind of unexpected weather. Unique eyepiece opening adapts to most viewfinders for viewing through the lens not the plastic! 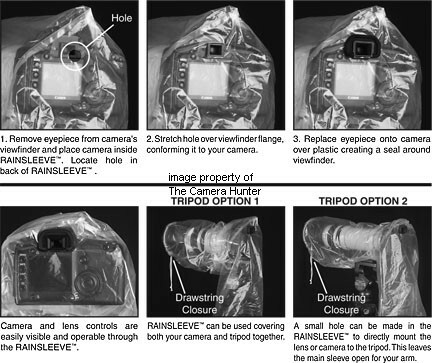 Camera and lens controls are easily visible and operable through the RAINSLEEVE FLASH. 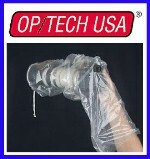 Here is a brand new produc from OP/TECH USA. These are a one size fits all product. It will fit any 35mm SLR camera or any D-SLR Digital camera ever made. 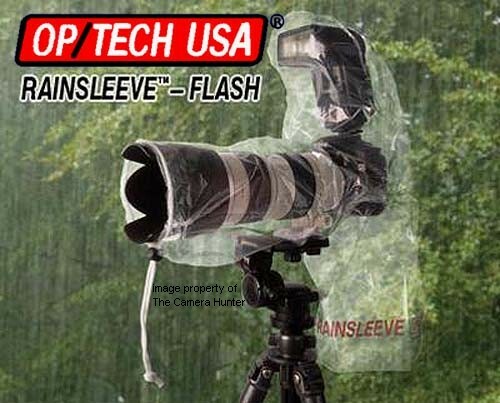 There is no better way to temporarily protect your expensive camera from the weather. The best part is they are very inexpensive. Don't let the price fool you, they are not cheap, just a good price. Used with a little thought and care will allow for years of faithful service. Each pack ordered contains 2 Rainsleeves #9001132. One shipping charge regardless of how many packs you order. Unique eyepiece opening adapts to most viewfinders for viewing through the lens not plastic!